Welcome to Ibiza Diving Holidays , Our guide to your diving on Ibiza. A three-dimensional universe full of secrets including mountain ranges, multi coloured fauna, masses of wildlife and endless varieties of vegetation. Ibiza diving has an underworld of enjoyable sea life its also an experience of tranquility and sensational feelings. If you never dived before then here is the perfect place to start a new experience while you are on holiday here in Ibiza. 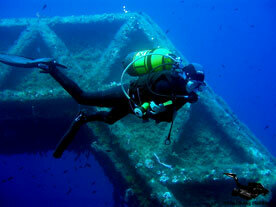 If you know how to dive then you will be interested in in some great dive sites for you too visit and explore with us. We have experienced team that know all the dive sites to assisit you. The seabed's of Ibiza hold many interesting dive sites for you to explore, Llado Norte which is a huge pinnacle rising 40 metres from the seabed, 'Tagomago Anclas' two big anchors lie on the seabed near the Island of Tagomago and many old shipwrecks rest around the Islands for you exploration. For anybody interested in trying Scuba diving while on holidays in Ibiza we can offer you the Discover Scuba Diving program. This is run from the beach directly in front of the dive Centre in a zoned off area free of boat traffic with loads to see. The maximum depth to this dive site is 5 metres but you will be amazed and what is out there. Daily we find octopus cuttlefish as well as brightly coloured wrasse to make you dive experience truly one to remember. Divided into 3 parts the Discover Scuba Diving program is a PADI sanctioned course that allows you to feel the freedom of diving in half a day of your holiday. Theory, practice and dive it’s that easy with 1 instructor for every 2 beginners making your day a VIP experience.